JAEGER LECOULTRE REVERSO GYROTOURBILLON 2 WHITE GOLD Jaeger-LeCoultre, Reverso Gyrotourbillon 2, No. 2/20, case No. 2667021, Ref. 247.3.07. Made in a limited edition of 20 sets in white gold. Sold on December 18th, 2009. Complicated and extremely rare, large, rectangular, reversible 18K white gold wristwatch with visible Jaeger- LeCoultre caliber 174 with inclined two-cage multi-axis spherical tourbillon, 50 hour power reserve and 24-hour indication, "1000 Hours Control," and an 18K white gold Jaeger-LeCoultre double deployant clasp. Accompanied by the original fitted box, guarantee certificate, instruction booklet, Magnifying Glass and loupe. Five-body, solid, polished, reeded bezel, transparent case back, sliding lock in the band at 4, sapphire crystals. Transparent off-center sapphire grey ring dial with painted white radial Arabic numerals, outer minute track, subsidiary 24-hour silver ring dial at 9, the lower half with aperture to view the Gyrotourbillon, sector for the 50-hour power-reserve indication on the reverse side. White gold epee hands. Cal. 174, rhodium-plated, fausses cotes and hounds-tooth decoration, 28,800 vibrations per hour, 58 jewels, one-minute rotating exterior tourbillon carriage and 3.2 rotating per minute interior cage, 14K gold balance and adjusting screws, lateral lever escapement, Self-compensating helical balance spring, 6 shock absorbers on all axis pivots. Dial, case and movement signed. C. Five-body, solid, polished, reeded bezel, transparent case back, sliding lock in the band at 4, sapphire crystals. D. Transparent off-center sapphire grey ring dial with painted white radial Arabic numerals, outer minute track, subsidiary 24-hour silver ring dial at 9, the lower half with aperture to view the Gyrotourbillon, sector for the 50-hour power-reserve indication on the reverse side. White gold epee hands. M. Cal. 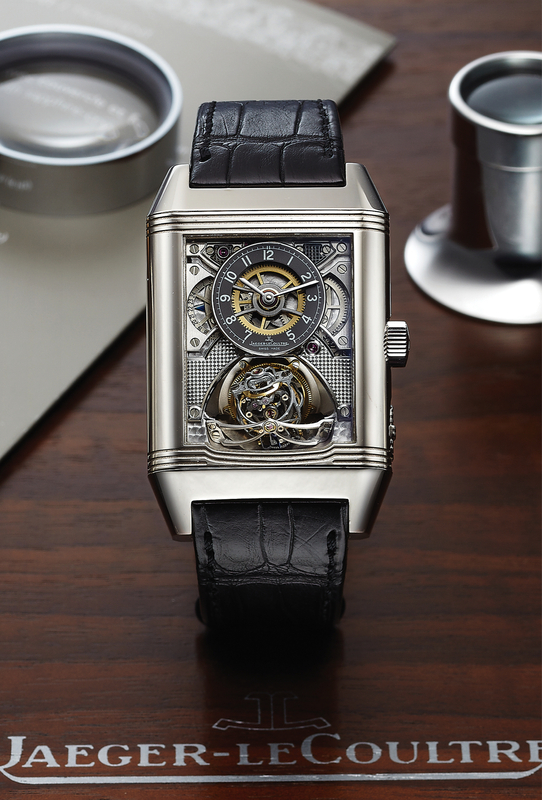 174, rhodium-plated, fausses cotes and hounds-tooth decoration, 28,800 vibrations per hour, 58 jewels, one-minute rotating exterior tourbillon carriage and 3.2 rotating per minute interior cage, 14K gold balance and adjusting screws, lateral lever escapement, Self-compensating helical balance spring, 6 shock absorbers on all axis pivots. Dial, case and movement signed. DIM. 35 x 55 mm. THICKNESS 15 mm.